C&R has been doing its thing for two decades now and is as good as ever. 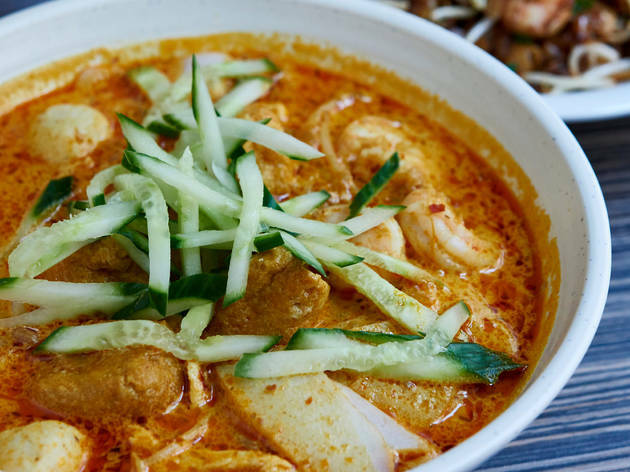 Squeezed into a narrow Chinatown alleyway, this Malaysian café-diner isn’t the easiest place to find, but it’s worth going on a hunt for: you’ll be rewarded with terrific-value, excellent food. The vibe is functional but contemporary: think wipe-clean tables, pleather and stone in pale blues and greys. Staff that are friendly but terrifyingly efficient. Lighting set to ‘interrogation-level-bright’. So not somewhere for a cosy first date, then. But on a recent re-visit, everything – from the must-order laksa (an absolutely giant bowl, its coconutty soup base packed with juicy prawns, vermicelli, fish balls, the works) to a slippery, smoky, umami-rich plate of Chinese-Malay char kway teow – was excellent. The roti canai were crisp-edged and buttery, while a classic nasi goreng saw a huge mound of rice teamed with warmly spiced chicken curry and all the usual condiments: dried shrimp, chilli sambal, roasted peanuts and so on). The only disappointment? They’d sold out of the celebrated beef rending. Still, that’s a good reason to go back. Soon. Dinner for two with drinks and service: around £55. I've been looking for a place to have Singaporean food, but unfortunately this one didn't quite deliver. The menu is large and the food arrived fast, but the noodles had a bitter burnt flavour and the roti canal dip is a bit bland. We loved the braised pork belly though! Just came back here from eating dinner tonight. I had the Tom Yum starter soup which was pretty bland for me. I also had the tofu skewers (not happy they were fried) but loved they were doused in chunky peanut sauce with red pepper flakes. Still there were some pop of flavour missing. Also unimpressed the mains are not served with rice and that has to be ordered separately. My husband enjoyed his beef randang though. And I have to admit my husband’s order of Malaysian roti was delicious: buttery and crisp at the same time. And my friends their huge soup noodle bowls. So maybe I'm the odd one out. Huge menu but not a ton of veg options. 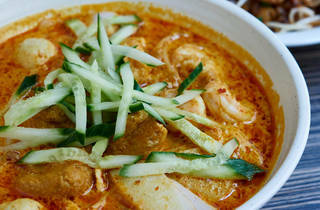 C&R Cafe is a cheap and cheerful establishment that delivers well if you have a craving for Malaysian food. The food is as good as the nearby Rasa Sayang but their staff seem just that little bit more friendly. The chicken and noodle dishes are so good - real comfort food. The Roti and Laksa are pretty cool too. This is the place to visit if you are missing Malaysian food - from home or holiday. It offers you fabulous food fast. When I get cravings for solid Malaysian and Singaporean cuisine, I go to C&R. It’s no fuss, flavoursome food that never disappoints. Oh, and it’s also cheap and cheerful. What more could you want? The Hainanese Chicken Rice is a favourite here and you can choose between breast meat or dark meat. The stir fry dishes all have great “wok” flavour and the Laksa and Nasi Lemak here is also solid. The bubble tea and other selection of Asian drinks here is also on point. Overall, for a quick, cheap and satisfying meal, this place is really a no-brainer. Tip: do get in early as they can get quite busy. It’s not really a eat and chat type of place as the food comes fast and they do expect you to vacate the table as soon as you’re done for waiting customers. Good For: cheap and cheerful, small groups, quick meal, casual dinner/ lunch. In the 10 minutes between the place opens and waiting for my friends to arrive, we were given the last table. Wasn't expecting this to be so popular. You get quick and friendly service, and massive servings for a low price. The food was good, no wonder it's always packed out! Make sure you're hungry, it takes dedication to finish a whole dish.